When historians discuss U.S.-Soviet relations, they tend to place a special emphasis on the personal relationships formed between the leaders of the two superpowers. The common examples include FDR and Stalin, Reagan and Gorbachev – but what was the relationship like between Richard Nixon and Leonid Brezhnev? They met more often than any Soviet premier had with a U.S. President (save Reagan and Gorbachev ten years down the road) and their initial rapport of mistrust grew substantially into a cordial friendship that directly impacted arms negotiations. The openings to Mao’s China in February 1972 threatened to place the Soviets on the diplomatic backbench. Since the 1950s the Soviets and the Chinese had experienced a rift in relations, and RN tactfully exploited this to further U.S. interests. This only increased Moscow’s sense of urgency in talking to the Americans; pressured by America’s new relationship with China, Brezhnev wrote the President and invited him to the Soviet Union for a week of summits – the first time a sitting U.S. President would visit the USSR. But problems began to mount – only days before the summit, RN stepped up the bombings of North Vietnam, angering the Soviets. Many Soviet reporters and government officials were unsure what to think of Richard Nixon. He was a Cold War hawk, one-time challenger of Nikita Khrushchev who had ordered bombings of North Vietnam and incursions into Cambodia to take care of Soviet-backed Vietcong sanctuaries, which had been staging devastating attacks on South Vietnam. To his Soviet hosts, this confirmed his willingness to take necessary steps to achieve his goals, and this was no more evident than in regard to China. The suspiciousness extended to General Secretary Brezhnev, who sent his number two man to greet the President as Air Force One touched down in Moscow for a week of summit negotiations in May 1972 (the Soviets called the reported snub a point of protocol – Brezhnev was not the official chief of state, though they forgot this point later in the week – Brezhnev signed all the official documents). The negotiations were hailed as breakthroughs for U.S.-Soviet relations – and personal relations between the two leaders. Brezhnev enjoyed entertaining foreign visitors at his dacha, where he and RN shared toast after toast. 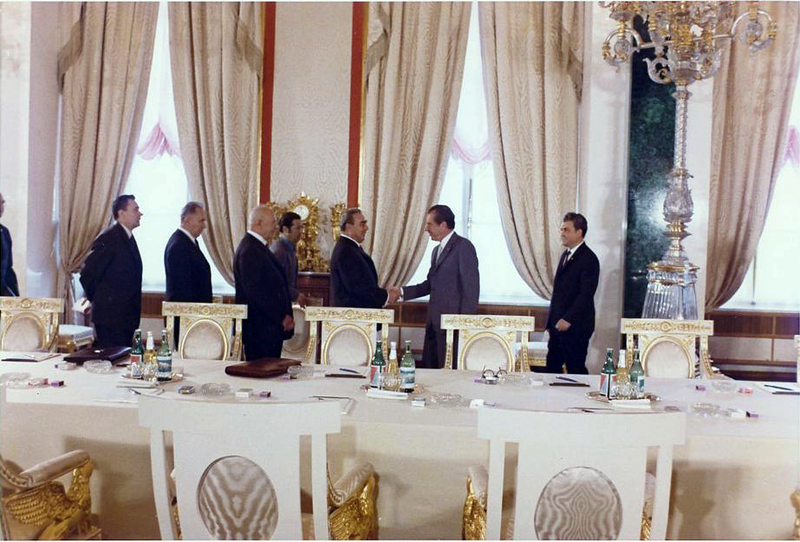 The culmination of the week of successes was the signing of both the Anti-Ballistic Missile Treaty and the SALT agreements (the Russians had indicated that no wives were allowed at the signing ceremony, so Mrs. Nixon slipped in the back door and hid behind a pillar), as well as the adoption of a new policy method, détente, which would dominate U.S. and Soviet policy for the next decade. They put policy differences aside and instead began to come to know and understand one another. At the end of the week Brezhnev slapped RN on the knee, hopeful that they had developed a good personal relationship. Another “stunning triumph of Nixonian diplomacy” is how historian Conrad Black described it. The summit the following June saw Brezhnev welcomed to the White House with full military honors. Securing a permanent SALT agreement was RN’s chief goal, and progress was made on the matter, as well as those of European security and Jewish emigration from the USSR. It is customary for visiting heads of state to stay at Blair House, a simple walk across the street from the White House, though Nixon made arrangements for Brezhnev to stay at Camp David instead. What better gift to give a new friend than a new car – a brand new Lincoln Continental, in this case, and Brezhnev’s eyes lit up when he saw it. He took the wheel, motioned Nixon into the passenger seat, and sped off at 60 mph, careening down the narrow, winding roads to the horror of the Secret Service. He blew through a stop sign and lurched into traffic on a nearby highway. “That was something,” said a trembling Nixon, who later wrote that “Diplomacy is not always an easy art.” Within hours of their first meeting, Brezhnev announced that he had already invited the President back to Moscow for another summit. The camaraderie continued as Brezhnev joined RN on the Spirit of ’76 to San Clemente. Air Force One flew low over the Grand Canyon so that Brezhnev could get a glimpse of the shadowy canyon walls. “I’ve seen many pictures of this in newsreels and in cowboy movies,” he noted as he jumped back from the window, slouched his shoulders down, placed his hands on his hips, and drew imaginary six shooters from his imaginary holsters – his John Wayne imitation got the attention of everyone on board. One cannot imagine this type of humor coming from Stalin or Khrushchev. All was in place at La Casa Pacifica, RN’s beachside “Western White House,” for Brezhnev’s stay. The American and Soviet flags flew side by side. The rooms were prepared to host dozens. Brezhnev had been offered the chance to stay in more spacious quarters at Camp Pendleton – the large commandant’s house in fact, only a short helicopter ride away – but he adamantly rejected any of those suggestions. He was, therefore, in the words of Julie Nixon Eisenhower, “ensconced in Tricia’s feminine room, with its fragile white wicker furniture and walls papered in bold pink, blue, and lavender flowers.” It was no doubt amusing to see the brash, bear-of-a-man General Secretary resting comfortably in the room. The Nixons hosted a small dinner that evening in their dining room, with ample space for only ten people. “I want our children to grow up in a world of peace,” RN declared in his toast, “I propose this toast to your health, and that of our other guests, but even more to Mrs. Brezhnev, to your children and our children and all the children of the world who, we trust, will have a happier and more peaceful future because of what we have done.” Tearing up, Brezhnev threw his arms around the President “with a real bear hug.” As the two embraced, one must have believed that the prospects for peace between the two superpowers seemed more real than ever. Here were the two most powerful men in the world, enveloping themselves in a display of genuine affection. Word came to the President that evening while in his pajamas that the Russians wanted to talk. “I could not sleep, Mr. President,” Brezhnev said with a wary smile as the two commenced in a three hour tumultuous discussion on the Middle East. A crisis arose in October 1973, pitting superpower against superpower, and testing the resolve of détente, not to mention RN’s and Brezhnev’s personal relationship. Syria and Egypt jointly attacked Israel during its holiest of days, Yom Kippur, seizing miles of land. The Americans backed Israel; the Soviets, Syria and Egypt, via an airlift supplying tons of weapons and materials daily. After some initial harsh correspondence, a letter from Brezhnev arrived in which he suggested that both sides do their utmost to keep the events from taking a more dangerous turn. This echoed RN’s thoughts exactly: “If he was willing to get behind a serious peace effort, I would not consider that the Soviet airlift had affected our personal relationship or deflected the course of détente.” Indeed, a cease-fire was signed, however rocky it may have been, and the personal relationship was relatively unaffected. Despite the hysteria at home and a swelling blood clot in his left leg (the President suffered occasional bouts of phlebitis during his tenure), President Nixon went ahead with his scheduled trip to Moscow in June/July 1974 for Summit III. This time he was welcomed at the airport in the most ceremonious welcome the Kremlin could put on. Brezhnev bounded across the tarmac to shake the President’s hand while crowds lined the motorcade route, cheering and eagerly waving American and Soviet flags. It was quite a change from two years ago. Eager to accept any reasonable agreement with the Soviets, the two leaders settled down to hard talks, raising the subject of a nuclear test ban treaty and how to ensure each side would be comfortable with any agreements made in respect to MIRVs (multiple independently targetable reentry vehicles). Just as the Nixons had hosted Brezhnev at their “country estate,” Brezhnev insisted upon reciprocating. The U.S. delegation stayed at Brezhnev’s dacha in Oreanda, a small town outside of neighboring Yalta. The lavish dinner parties included a toast from President Nixon, in which he stressed “the personal relations and the personal friendship that has been established by these meetings.” Indeed, no American leader before had established a relationship with a Soviet quite like this one.